An oscilloscope is a test instrument that displays a graph of voltage verses time which allows the user to visualize electronic waveforms. The vertical axis displays voltage and the horizontal axis is time. 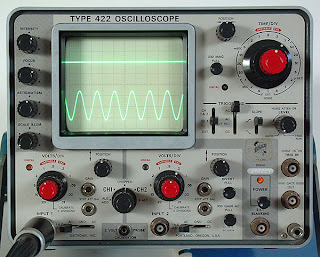 Modern oscilloscopes are either analog or digital. It is a must-have piece of equipment for experimenting or working on electronics and very useful to radio amateurs in general. So what can you do with an oscilloscope? You can determine how the voltage of a signal changes with respect to time. You can calculate the frequency and period of a waveform. You can test for malfunctioning components causing signal distortion. You can measure a DC voltage in a circuit. You can find what component of a signal is direct current (DC) or alternating current (AC). You can tell how much of the signal is noise and whether the noise is changing with time. You can attach a transducer and measure all manner of phenomena. You can create Lissajous figures. You can measure the timing of events having very brief durations. You can build a scope clock. You can check a DC power supply for AC leakage due to a bad capacitor. You can test to determine if components in a circuit are functioning correctly (resistors, capacitors, inductors, and semiconductors). You can measure the phase shift between two sinusoidal signals. You can measure the RMS value of a noise signal. You can use an oscilloscope as a very cool prop in a play or movie.